Vendors offer varied services to their clients which are why business organizations, as well as individual customers, prefer to deal with the same vendor on a long term notice. When it comes to making a request to the client or vice versa, it is always advisable that this is done in a professional manner with proper paperwork that is proof enough of his request. It is for this reason that Application Forms are used. There are an assorted variety of forms for various needs and these comprise of the essential segments that allow the vendor to make the request in a professional way. This form is used y vendors to allow their customers to make a request for a credit limit or alter the present limit. The form comprises of various subheadings which the customer should fill in with the relevant details. He may also have to list the reason for the request and his expectations in this form. A vendor is required to register himself with the government rosters in order to become a legal working entity. 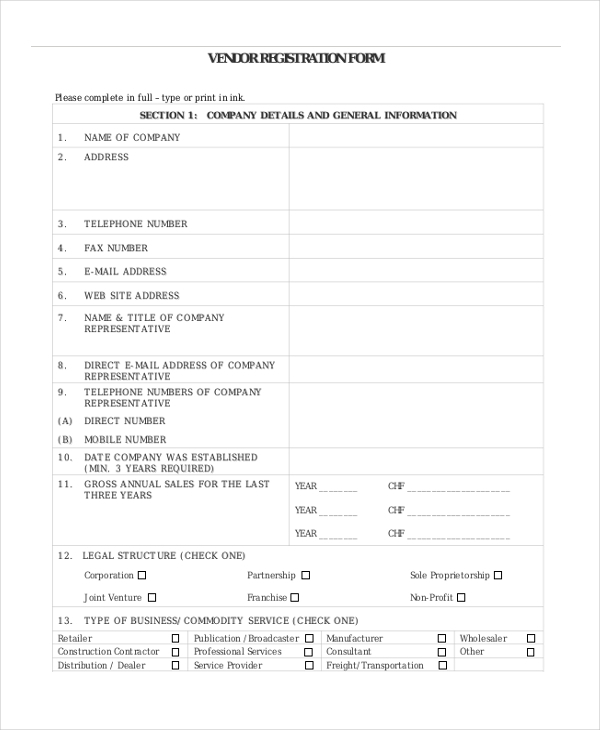 In such cases, the concerned agencies ask him to fill this form with the relevant details which are then reviewed and a vendor number is assigned to him. You may also see Grant Application Forms. 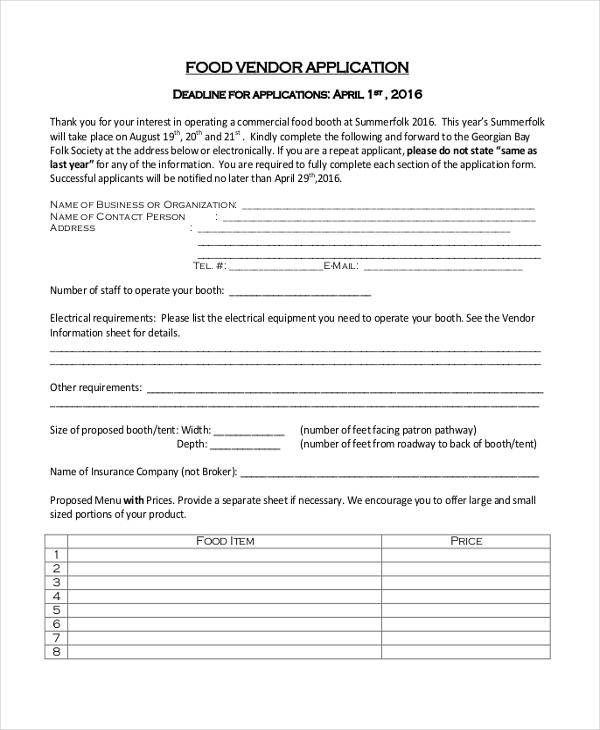 This form is used by the organizers of an event where they may be inviting vendors to put up their stalls. They use this application form to invite requests from vendors to secure a booth in the event. 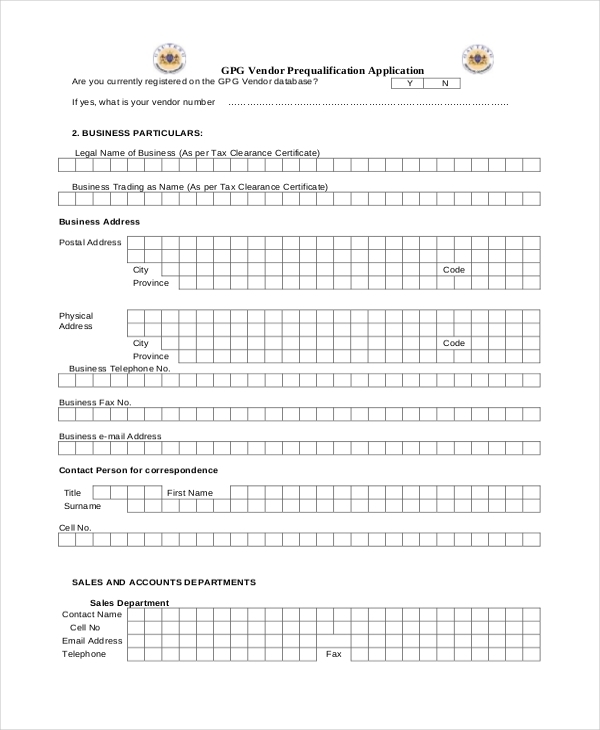 The vendor is required to fill in the details of his services in this form. 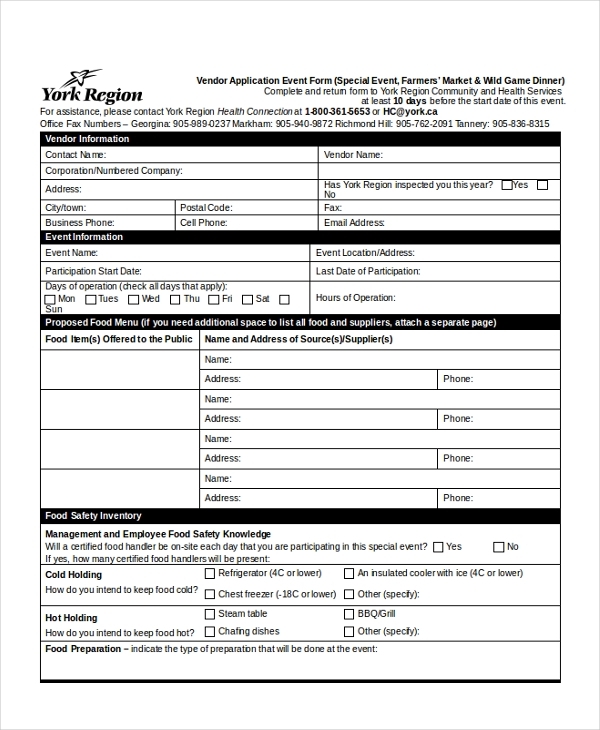 This form can be used by organizations and event managing committees to allow vendors to register on their rosters. The form comprises of an easy to decipher format and required subheadings making it easier for the vendor to fill in the relevant details. You can also see Volunteer Application Forms. An organization or person who may be involved in organizing an event can use the aforesaid form to invite requests from food vendors who may be willing to offer their catering services for the event. With all the required segments in place, customizing this form is quite easy. When a vendor wishes to get into a business relation with a company and deal with them on a regular basis, he is required to open an account with the company. It is for this reason that the organization uses the aforesaid form. It collects the important details of the vendor and then creates an account for him on its rosters. You can also see Application For Employment Forms. 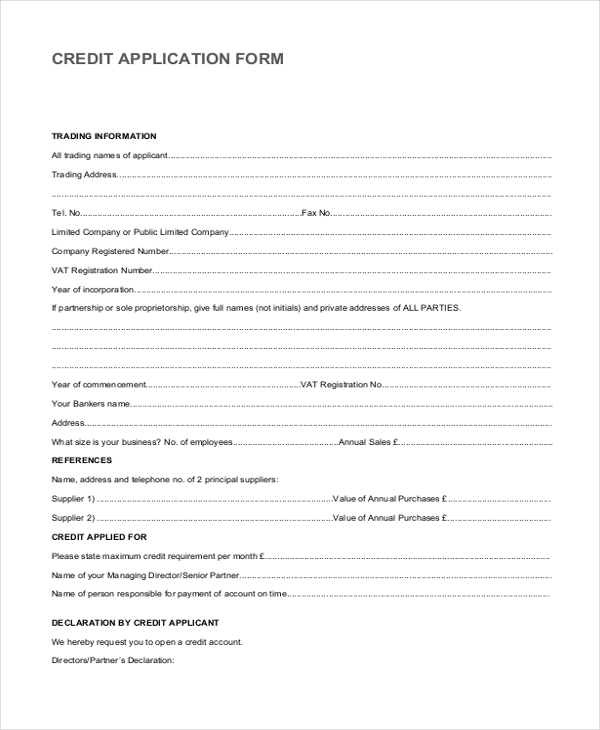 As the name indicates, this form is used by event management companies and event organizers to invite requests from vendors who may be interested in dealing with them on a regular basis. The form comprises of a number of segments that the vendor is required to fill in. 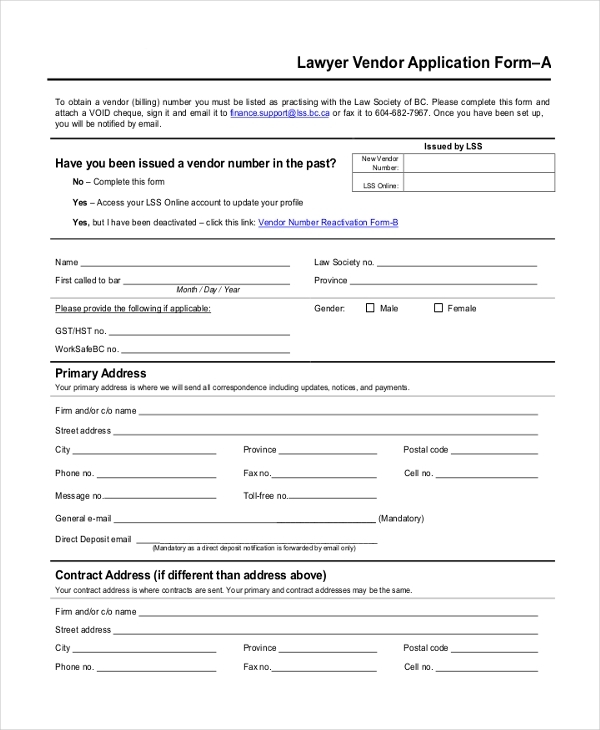 When a lawyer is approached by a vendor to help him in certain legal hassles, the lawyer uses this application form to collect the details of the vendor. The form comprises of a number of questions which help the lawyer to understand the details and the problems of the vendor. You may also see Sample Employment Application Forms. What are The Benefits of Using Vendor Application Forms? 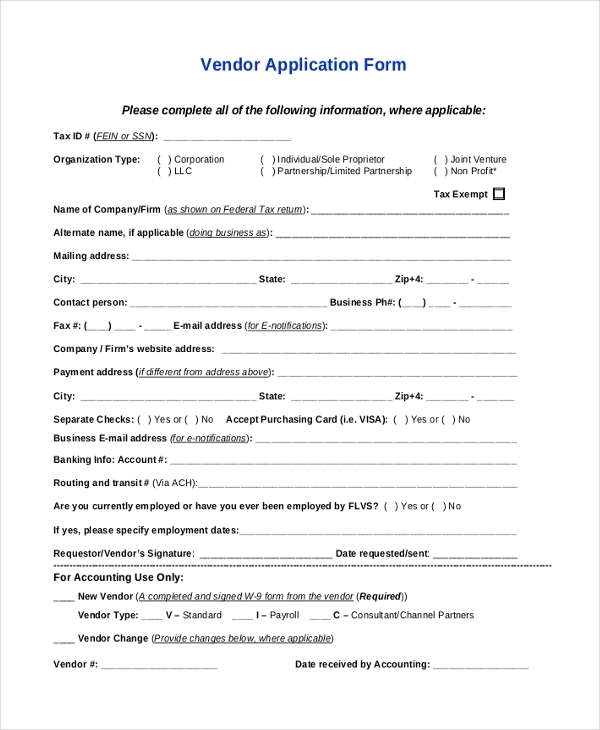 In case you need some help in designing a vendor application form, go ahead and check out our collection. With a wide range to choose from, you are sure to find one that will be apt for you. Download and customize this easily without any professional help. These forms are compatible with most devices and are hence an ideal choice for all. You may also see Employment Application Forms.